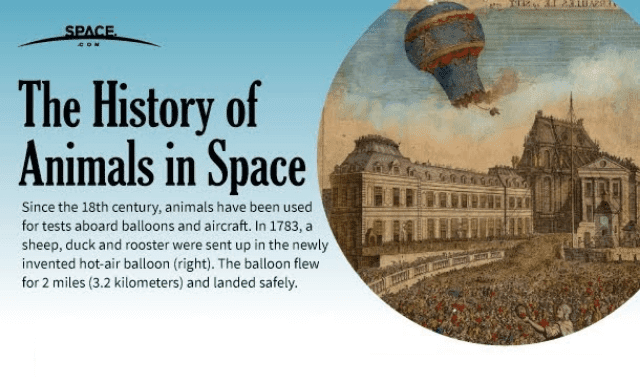 A History of Animals in Space #Infographic ~ Visualistan '+g+"
Since the 18th century, animals have been used for tests aboard balloons and aircraft. In 1783, a sheep, duck and rooster were sent up in the newly invented hot-air balloon. The balloon flew for 2 miles (3.2 kilometers) and landed safely. The first animals in outer space were fruit flies launched in a captured Nazi V-2 rocket on Feb. 20, 1947. The flies reached an altitude of 68 miles (108 km) and were recovered alive by parachute. Take a look below for more interesting information.